Meryl Streep in The Iron Lady. 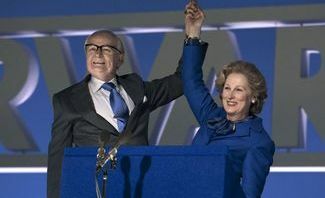 The Iron Lady won an Oscar for Best Actress (Meryl Streep) and Best Makeup. MERYL Streep was a popular Best Actress winner, The Artist triumphed and Australian editor Kirk Baxter shocked everyone, but it was Angelina Jolie's right leg which stole the show at the 84th Academy Awards. Jolie and partner Brad Pitt strode the red carpet with the rest of the A-listers who had spent a small fortune on their outfits. But when her naked right leg made an appearance, the fans went wild. Before Jean Dujardin had been named Best Actor, Jolie's leg had 2000-plus Twitter followers. The Oscar for most shocked and tongue-tied winners went to Australian editor Kirk Baxter and his US colleague Angus Wall (The Girl with the Dragon Tattoo). "Let's get out of here," a giggling Baxter told Wall after they stumbled through an attempt at an acceptance speech. There were plenty of other surprises and shocks throughout the ceremony, with Meryl Streep, for The Iron Lady, upsetting The Help's Viola Davis for best actress. Streep has been nominated 17 times, but the last 12 she went home from the ceremony empty-handed. Her last win was for Sophie's Choice in 1983. The Artist, the French-made black-and-white, largely silent film set in the late 1920s, dominated the top awards, with wins for best picture, best actor for its star Jean Dujardin and Michel Hazanavicius claiming the director prize over Hugo's Martin Scorsese. Australian producer Grant Hill had been a contender for the best picture Oscar for his film The Tree of Life. Hugo dominated most of the technical Oscars including visual effects, cinematography, production design, sound editing and sound mixing. Christopher Plummer broke through for his first Oscar win at the age of 82 for his supporting role in Beginners. "Where have you been all my life?" he said. What's next for The Artist stars?